Listen Up! Leeds Young Authors Need You! Did you know that a group of young poets from Leeds’ own Leeds Young Authors were placed second in the world at the 2009 Brave New Voices (BNV) International Youth Poetry Festival? That was an incredible achievement for a grassroots, non-profit organisation like LYA and put Leeds on the world youth spoken work poetry map once and for all. You can hear all about the artistic and personal journeys of those young poets in the award-winning documentary, ‘We Are Poets’. In July 2016, Leeds Young Authors are determined to take on the world yet again, and represent Leeds, Yorkshire and the UK at BNV in Washington DC. Besides the competition, BNV offers an intensive program of workshops, seminars and community building activities and provides an invaluable learning experience for young poets so that they may continue their outreach back home. In keeping with LYA’s commitment to developing community and opportunities for alumni, Saju Iqbal Ahmed, one of the LYA poets from the 2009 runner-up team, and Zodwa Nyoni, an LYA alumna and past BNV performer, are coaching the 2016 team. Malika Booker will be part of the team’s developmental process as a visiting artist. Of course Khadijah Ibrahiim, LYA’s artistic director, is supporting the team in all aspects of their journey. The team’s captain is Aoife O’Conner (aged 18), and she will be joined in Washington DC by Khalidah Jamilah (aged 15), Rebecca Mbuyi (aged 17) and Darren Phillip (aged 18). Over the next five weeks we will be blogging about each of our young poets from Leeds, writing about their journeys as artists and their hopes for BNV and beyond. The team has an enormous task ahead of them to do us all proud in Washington DC in July. They are meeting regularly for writing and rehearsal – at the Mandela Community Centre, the West Yorkshire Playhouse, and in parks, libraries and public spaces across Leeds. If you’re lucky you might catch a glimpse of them in action, as we did when we managed to take some sneaky photos for this blog. Be sure to wish them luck if you do! Besides focusing on their artistic preparation, the team is also fundraising and looking for sponsors. They are seeking to raise about £6,000 to cover registration, flights, accommodation and meals. Besides other initiatives, they have set up a Gofundme site that you can donate to. You can also contact Emilee Moore (an LYA volunteer) on 07717030916 or E.MooreDeLuca@leeds.ac.uk for more information about this project and ways you might be able to support it. 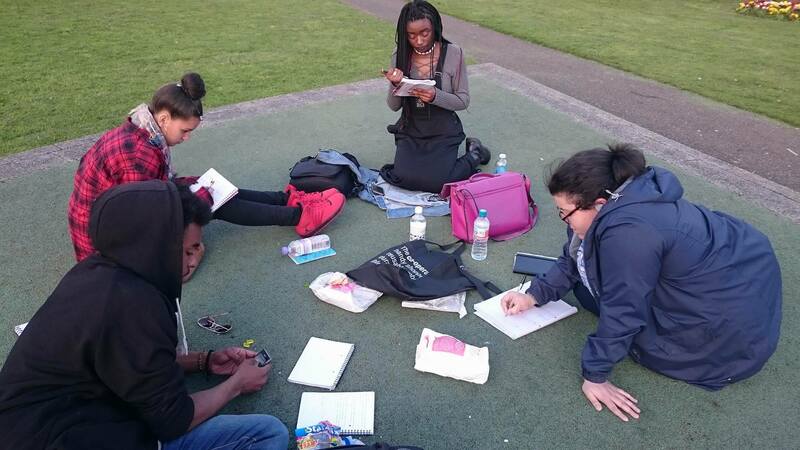 Follow Leeds Young Authors on twitter @LYApoets and on Facebook. "art is meant to make you feel something"